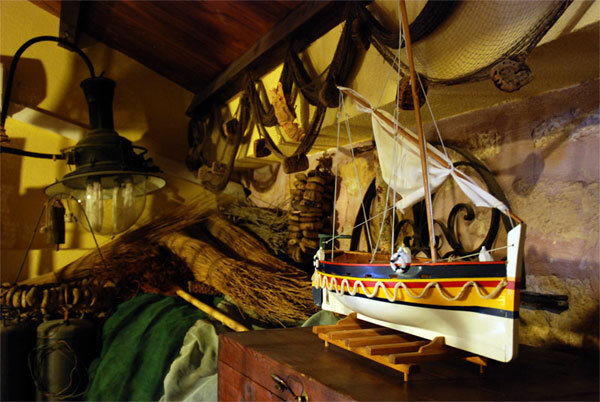 A Castellammare del Golfo, ancient emporium of nearby Segesta, in the picturesque setting of Cala Marina, the museum was born of the sea. Inspiring a local fisherman and maker Antonino Paradise, creator of’ cultural association UZZAREDRU. The museum, located in a house of fishermen, contains tools and fishing gear of yesterday and today's typical of the navy of the place and traps, not long ago working nef Gulf (tonnara Magazinazzi, trap day Castellammare, tonnara Scopello, Dry the tuna). The museum was established with the aim of sensitizing the community to the problems of the sea, dell’ environment and the recovery of cultural property, to know the traditions, The history of manners and ways of being of the seafaring community, cultural heritage of inestimable value to be passed down to future generations. All’ interior of the impressive home of the Museum, the visitor and fascinated by the sight of fishing gear, of the networks, of rope, that not long ago was used by the fishermen to build the instrument of labor, smell the scent of the sea and the swell noise. Antonino Paradise, teacher of seamanship, but above all a man of great sensitivity and true culture, and’ always available to explain and clarify the museum's guests, and picking up old tools that were used to repair, build networks and tools, to bring the visitor to the traditions and culture of the people of the ship.